With my love of the sea and being drawn to the coast this summer it is very difficult to ignore the tides and of course the moon which controls them. This shoe is an homage to the mystical moon which can be held responsible for all things mystic and physic. The moon’s surface is represented with a pattern applied using my a VT-like process I pioneered. The “skin” is very durable and can withstand daily wear. The shoe is then made to glow on the outboard side and reflect light on the inboard side. These contrasts bring the surface of the moon print to life and truly embody the theme. Watch as the cratered surface comes to life once darkness falls, revealing every nuance and detail. Then when flashed by the sun or artificial light, the surface reflects with great vibrancy. Check out more images after the jump or look at the high resolution image gallery. You can also purchase after the jump or in the AF1King Shop. This is my latest addition to the 1 of 1 Custom LeBron 9 Galaxy Foamposite series that I offered a select few who reached out to me after my “King of the Galaxy” project sold out. 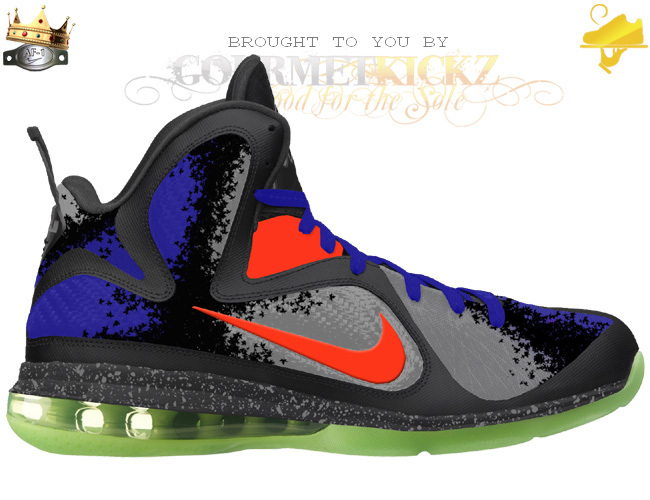 This version uses a grey and white base LeBron 9 Foamposite. I customized this pair with a different galaxy print and decided to make this one really pop by treating the flywire mesh portions to glow in addition to the sole, laces, and swoosh. The result is yet another well cooked and damn near nuclear dish. If you really must have a pair and are prepared to pay a premium and wait for this dish to be cooked to your specs, you email me. I may decide to launch a product listing for a bespoke session so stay tuned. There are more images after the jump and plenty more pics to come in the image gallery. Once again straight from the back burner and into the oven set to broil is an idea that has been cooking ever since the Custom Nerf LeBron craze began. I am not one to copy cat, but certainly one to go against the grain and put my own twist on popular trends. I cooked this dish up with inspiration from the Nike KD 4 Nerf and in acknowledgement of popular custom takes on the shoe. I decided to reverse the artwork layout and place it not on the hyperfuse, but on the flywire mesh and fiber sidewalls. While the above image is just a mockup, you can certainly see from my track record of mockups vs actual shoe comparisons that I am more than capable of cooking this recipe up to perfection. Just like my “MVP In South Beach” this sneaker will feature a custom insole, it will also come with legit concord colored Lebron 9 laces and an extra pair of legit volt green LeBron laces. This custom launch will deliver starting in September which means orders should be placed now. My average construction window is ranging from 2 to 3 months. I apologize but I simply do not rush work, and if clients wish to continue to receive best in class customer service and there can only be one Chef, then this is how it will remain. Quite frankly, I prefer to give great customer service and take my time on work than push out rushed sloppy projects. I may decide to limit this piece so if you wish to order you can cop a pair after the jump or head on over to the AF1King Shop and select some more goodies to feed your appetite for GourmetKickz. 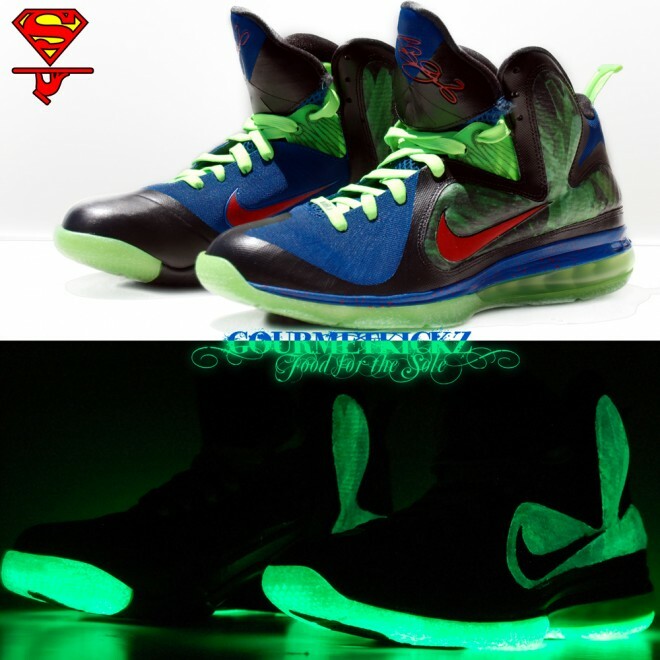 Previously I launched a mockup and pre-sale for a Superman vs. Kryptonite themed LeBron 9 as part of my Heroes and Villains theme. 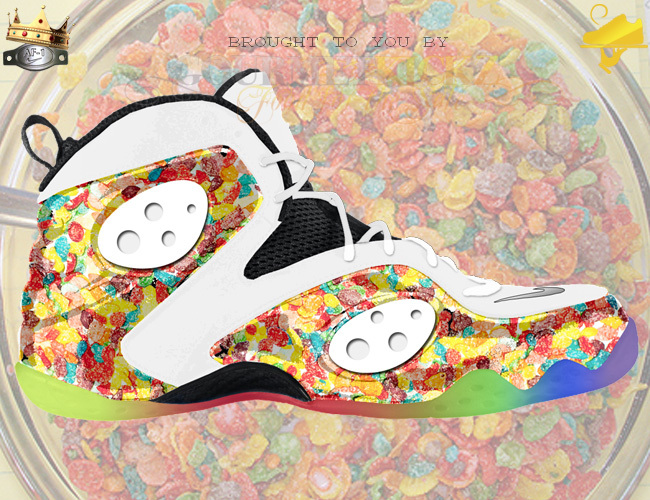 What I didn’t plan on was that as I made one of these, I would end up creating more a Doernbecher AJ 4 inspired dish. Well I let my instincts go and made some changes on the fly. The results of following my gut is the masterpiece you see before you. Not much has changed from the originally planned design, but the final piece has so much more impact. The blue flywire pops against the black hyperfuse, as does the volt green accents. A great finishing touch was the addition of the Superman emblem atop the LJ logo at the heel’s pull tab. Check out a few more images after the jump and be sure to pre-order a pair. 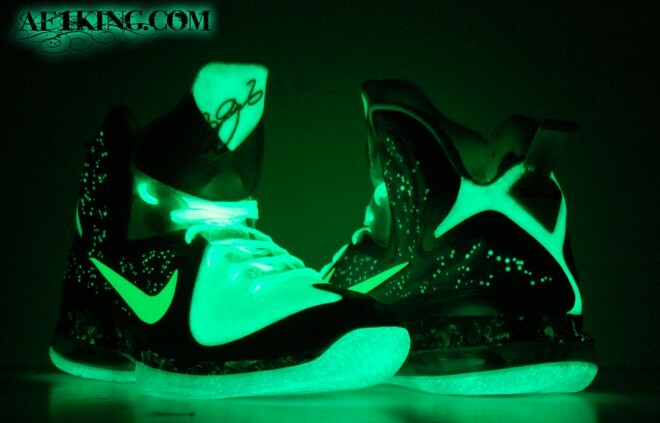 You will not be disappointed with this Custom Nike LeBron 9 from GourmetKickz and trust, it is worth the wait. What you see above is a preliminary mockup / sketch of an idea I may or may not bring to life. 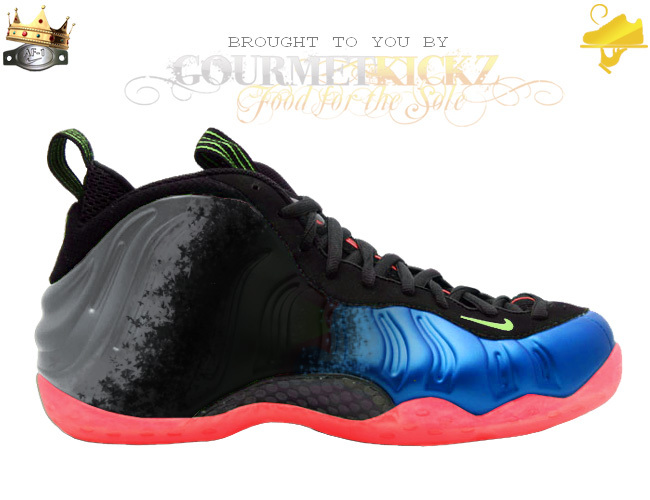 Using a base Royal Blue Foamposite One it is very possible that after dying the soles a bright crimson,painting the rear of the shoe metallic grey and using black KD Nerf-esque stippling to make way for the underlying royal (which would take the place of concord) a Custom Nerf-Foamposite One could be brought to life. Mockups as we all know are one thing, but seeing the completed shoe is another matter entirely. I have many projects on the books and will contemplate bringing this dish to life. Hit me up on twiiter or facebook to sound off on whether you think this is a dish best left in deep freeze, or if I should roast it on high and cook this sucker up well done for the masses! Bon A Petit! If you have been following my custom creations over the past several months then you are familiar with my previously cooked up LeBron 9 “Fruity Pebbles” Custom, which was based on an ID Foamposite LBJ9. 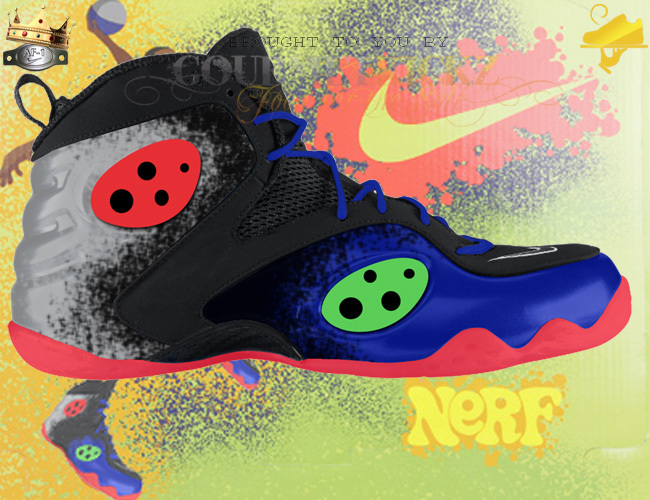 Well this go round I adapt the same theme to the Nike Zoom Rookie. This custom is very labor intensive and is reflected in the price tag. Understand this shoe is literally redone from top to bottom; nubuck upper is changed to white, sidewall orbs painted white, upper foamposite material is skinned with Fruity Pebbles pattern in my very durable VT Wrap method and sole is dyed to fade to each color represented on the blocked sole of the original Fruity Pebbles Lebron 4! The result is the above Breakfast fit for a Sneaker King! This sneaker is timed to ship for back to school, therefore an order placed now will carry a turnaround of 2 to 3 months. This hefty turnaround is due to the high volume of orders and there being only 1 Chef. If you wait to order, this will only prolong shipment as orders are not getting any lighter! Pre-order after the jump or head on over to the AF1King Shop to see what else is available. For those who doubt my sneaker cooking prowess, here is a link that shows some mockup comparisons to actual completed dishes. As many of you know, initially many releases are launched via mockup (like this image above) and hi-resolution actual shoe images are posted at a later date. Many of you have seen the recent craze over the P.E. 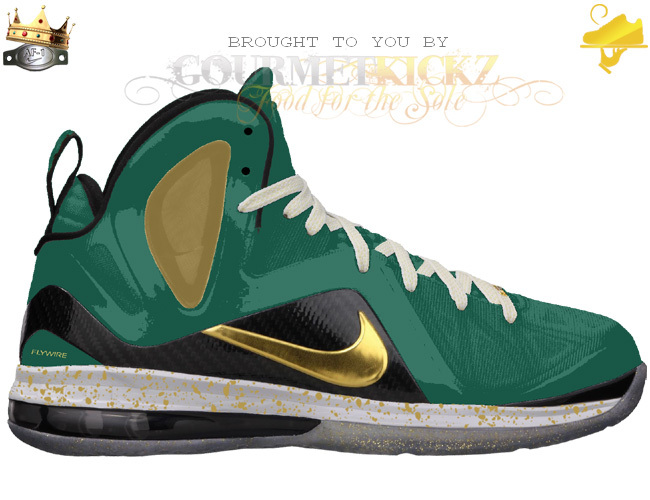 inspired LeBron 9 Custom that hit the web and ebay, but no one has seen what Chef’s got cooking until now! 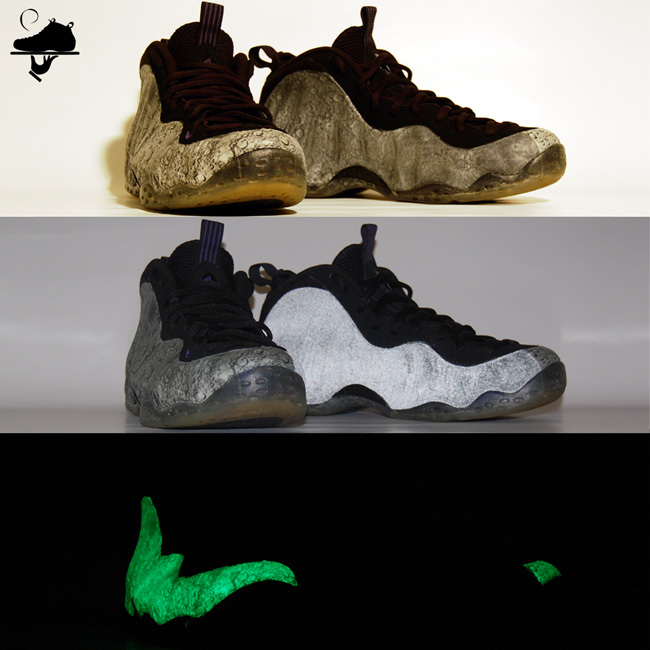 GourmetKickz has long been the preferred source for custom Nike kicks, and innovations like this keep me and my brand relevant. While I thought this was an obvious colorway for the LeBron 9 Elite “Home” base, it seems I operate on a different wavelength. If you adore the SVSM colors like I do, then you will surely want to pre-order this custom piece now to be fresh for back to school. After the jump is the purchase option if you want the base shoe to be included in your purchase. Already have the Home color and want to use it as the donor shoe? No problem, here is the adjusted pricing link >>> (pre-payment required, shipping label emailed after purchase).